Wednesday December 2- 1931 I wrote LeGrand in AM and Ida in PM. I felt badly late in the afternoon on account of an attack of bladder trouble I have not had it for 6 years. Rob & Hattie here. We could not get the Doctor Thursday December 3rd 1931 William & Mary went to Davenport Dr Ned Smith got over to see me. Hattie came for the day Not very comfortable. Letters from Laura & Mattie Stitt Friday December 4- 1931 I was in bed all day A bit more comfortable Ott & Hattie went to Mr Fisher funeral at The Church in PM. I had a letter from Kate Rowe wrote her. William & Mary home at supper time Saturday December 5- 1931 In bed till the middle of the afternoon. Still very wretched but got ready to go Whetstones. Rob came for me. I ate supper with the family Rob cashed $110.00 in checks for me today and put it in his safe. Threatening rain. "Buster" has been badly hurt. 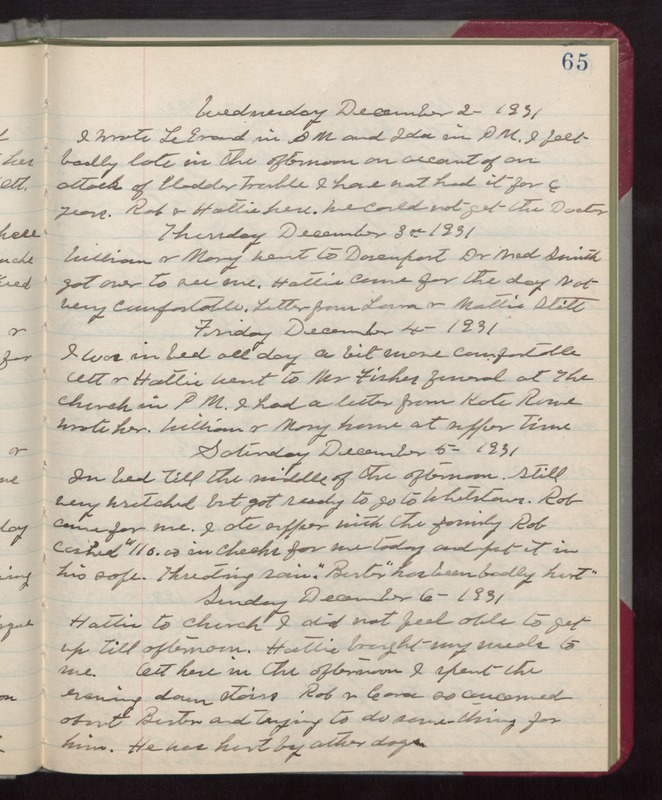 Sunday December 6- 1931 Hattie to church I did not feel able to get up till afternoon. Hattie brought my meds to me. Ott here in the afternoon I spent the evening down stairs Rob & Cora so concerned about Buster and trying to do some-thing for him. He was hurt by other dogs.